Bacharach’s Tru Pointe® IR is a handheld refrigerant leak detector that utilizes a long-life infrared sensor to locate and effectively pinpoint leaks containing CFC, HFC, HCFC and HFO-1234yf refrigerants. Accurate detection with rapid response times, a long-running rechargeable batter and a lightweight design deliver superior performance in a compact size. 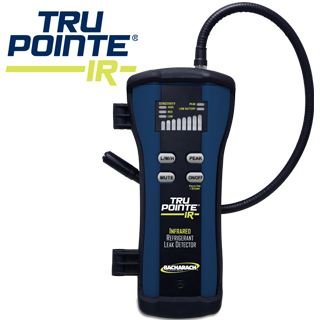 The Tru Pointe® IR is designed specifically for technicians looking for an easy-to-use, reliable, and instantly responsive leak detector that can quickly and accurately mark any leak spot. The instrument can automatically recalibrate in highly contaminated areas to help pinpoint the exact location leaks and will not trigger on oil or moisture. Simply turn the unit on, and let it mark the spot! The Tru Pointe® IR is designed to meet SAE J2791 and J2913 leak detection standards and its infrared sensor is engineered to provide a minimum of 10 years of dependable performance. 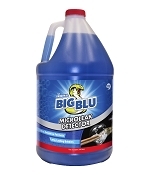 Its the ideal tool for HVAC Service Technicians, Refrigerant Service Technicians, Plant Maintenance Departments, Automotive Service Facilities, and Refrigerant & Environmental Chamber Manufacturers who are in need of a small, lightweight, and rugged refrigerant leak detector. With a flexible 15" probe as well as rigid probe extensions, the The Tru Pointe® IR is capable of detecting and pinpointing small to large refrigerant leaks in tight spaces such as those found in refrigeration units and automobile engine compartments. The instrument and all accessories are easily stored or transported in the included hard-shell carry case. Three levels of sensitivity detection from 0.5 to 0.15 oz./yr. 398 TruReward$ points will be placed in your account when you buy this item.